What if the best responses to peak oil and climate change don’t come from government, but from you and me and the people around us ? In 2008, the best-selling The Transition Handbook suggested a model for a community-led response to peak oil and climate change. Since then, the Transition idea has gone viral across the globe, from Italian villages and Brazilian favelas to universities and London neighborhoods. In contrast to the ever-worsening stream of information about climate change, the economy, and resource depletion, Transition focuses on solutions, on community-scale responses, on meeting new people, and on having fun. The Transition Companion picks up the story today, drawing on the experience of one of the most fascinating experiments under way in the world. It tells inspiring tales of communities working for a future where local economies are valued and nurtured ; where lower energy use is seen as a benefit ; and where enterprise, creativity, and the building of resilience have become cornerstones of a new economy. The first part discusses where we are now in terms of resilience and vulnerability in the face of rising oil prices, climate change, and economic challenge. It presents a vision of the future if we do not address these issues, and how things might change if we start to do so. The book then looks in detail at the process a community in transition goes through, calling on the experience of those who have already embarked on this journey. These examples show how much can be achieved when people harness energy and imagination to create projects that will make their communities more resilient. The Transition Companion combines practical advice—the tools needed to start and maintain a Transition initiative—with numerous inspiring stories from local groups worldwide. 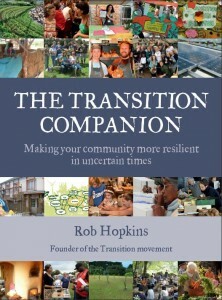 Rob Hopkins is the cofounder of Transition Town Totnes and of the Transition Network. He has many years’ experience in education, teaching permaculture, and natural building, and set up the first two year-full-time permaculture course in the world, at Kinsale Further Education College in Ireland, as well as coordinating the first eco-village development in Ireland to be granted planning permission. He is author of Woodlands for West Cork !, Energy Descent Pathways and most recently The Transition Handbook : From oil dependency to local resilience, which has been published in a number of other languages.